SPLASH YOUR EASTER TABLE WITH A CUPCAKE BOUQUET OF COLOURS. Knock, Knock Cupcake delivery. Don’t make this be you because your wallet will feel the crunch. Gourmet cupcakes cost a fortune to buy from local bakeries but there’s no need to spend $2-$5 for one cupcake when you can easily make them at home for far less. For you last-minute Easter bakers out there put your apron on and get ready to bake some Easter cupcakes that everyone will think you bought from the local bakery. 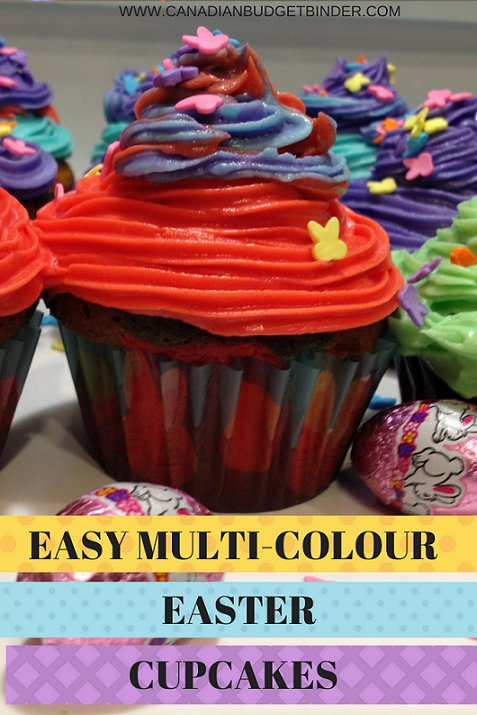 Easter Baking for toddlers doesn’t get any more colourful then these adorable multi-coloured Easter cupcakes. Mrs. CBB and I wanted to involve our son in baking these Easter cupcakes as a tradition for our family. Fun Easter desserts are also a perfect way to celebrate the beginning of Spring at home, work or for the kiddos. They will add more sweetness to the already chocolate-filled diet that most of us will have for the month of April. I can handle that though and so can our little guy although we have to limit his chocolate intake otherwise he would eat it day and night. Baking takes creativity, a steady hand and patience to be successful. We both plan to commit to teaching our son basic kitchen skills including baking which is not the easiest trade to learn. I’m not a baker by any stretch of the imagination but I do enjoy creating recipes and I hope he becomes passionate about food like I am. That and the ladies like it when the men can bake and cook… right? 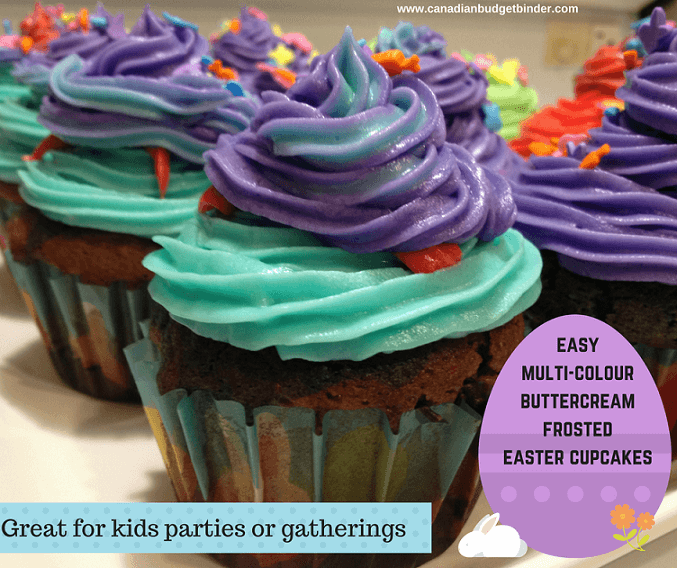 If you’ve been asked to bring in Easter treats for co-workers or for your child’s school or daycare these are simple Easter cupcakes to make. 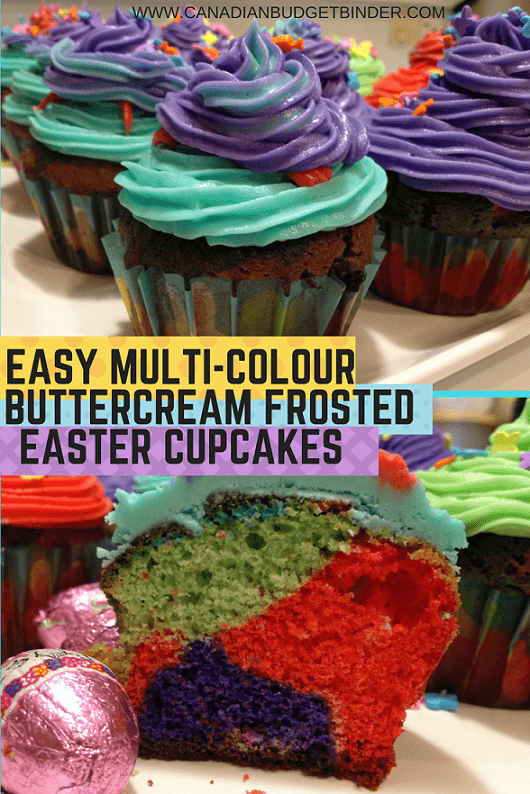 Colours are important at Easter so making sure you have vibrant Easter desserts are eye-catching. 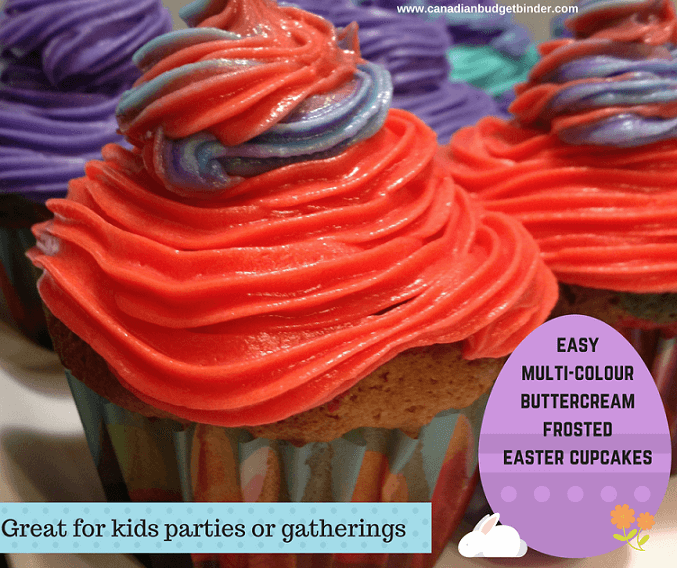 What I love about these Easter cupcakes is that they are versatile because you can use them for just about any special occasion. They would make gorgeous Birthday cupcakes and you can change the colour of the buttercream frosting and white cake to fit the theme. Why not use for a fun wedding cupcake? Decorating Cupcakes takes skill and to be honest I’m surprised these Easter cupcakes turned out as gorgeous as they did. I was just winging the entire decorating part. My hand is not as steady as I’d like plus I don’t decorate cakes and cupcakes on a regular basis. The more you decorate baked goods the better you will get at it. We have a pampered chef decorating system that Mrs. CBB got a million years ago when she hosted a party at her apartment. I will have to say that it’s a pretty good system considering I’m not a pro-baker. I used a basic vanilla buttercream icing for the frosting and food colourings after dividing the batter and icing into 4 bowls. This may seem like lots of work but it’s not that bad at all. The hardest part was to try and balance the colours but in the end no one really cares. Some of the colours will mix together others won’t but it’s a rainbow of deliciousness. The purpose of the colours is to bring joy and if they marry so be it. Our son was jumping up and down waiting impatiently to sink his teeth into one of them which he did gracefully with his hands behind his back. Silly kid, but watching his little face light looking at the Easter cupcakes made this baking day worth it. Where can I find Easter cupcake liners? Easter cupcake liners are easy to find at just about any Dollar store or the Bulk Barn carries all sorts of Easter baking accessories. You can also find the Easter candies at the Bulk Barn which are inexpensive and add a personal touch without all the decorating fuss. After making the buttery cupcake batter I divided it into 3 bowls and added the colours that I wanted to use for this recipe. 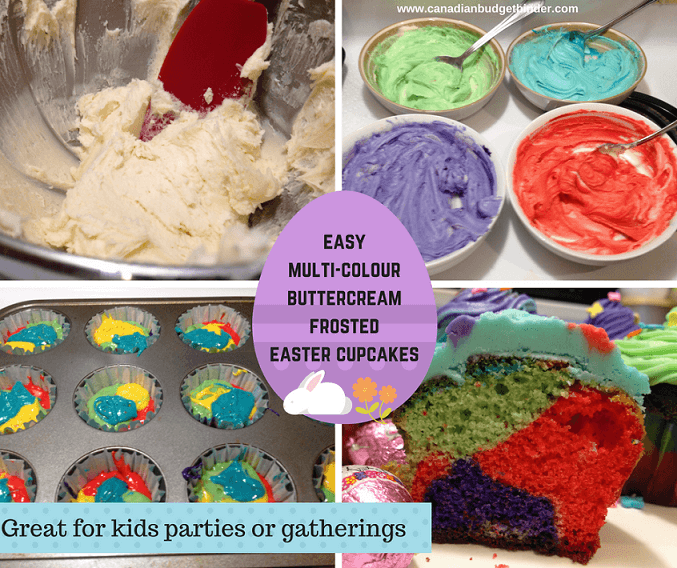 I find that pink, blue, yellow, green and purple are the perfect Easter colours when baking but you can use whatever you’d like. I used a mini ice-cream scoop and added a scoop of batter to each corner of the cupcake liner and then baked them in a 350 degree oven 18-20 minutes. Be careful not to over-bake the cupcakes or they will be dry. I use the toothpick method to test if the cakes are done. If your toothpick comes out clean from inserting in the middle of the cupcake they are done. If not keep baking but test often if it’s after the specified time in the recipe. Baking really is a science. 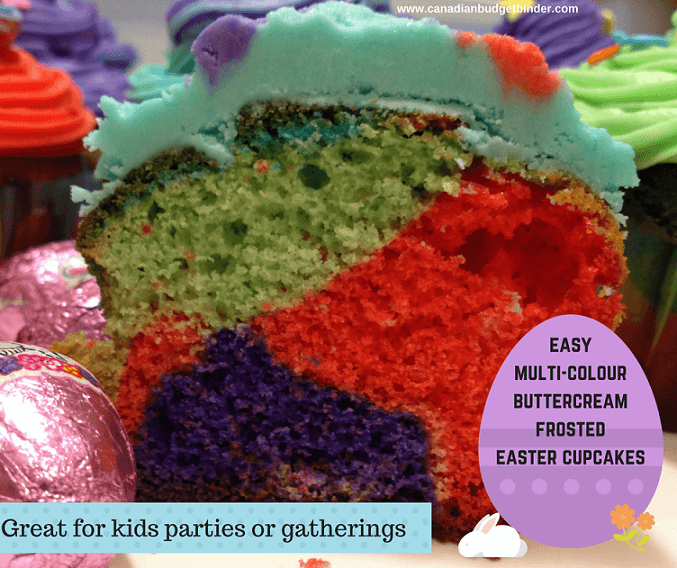 These inexpensive Easter cupcakes are splashed with colour and perfect for just about any occasion as you can switch up the colours to fit the theme of the party or gathering. Pre-heat oven to 350 degrees and line your 12-cupcake pan with cupcake liners This should make 20-24 cupcakes depending on liner size and cupcake pan. Bake at 350 for 18-20 minutes or until your toothpick is clean or the cupcake springs back. Set aside to cool completely for 10 minutes before frosting or the frosting will melt. You can make this while the cupcakes are baking or a day in advance storing in an air-tight container in the refrigerator. Mix again once you bring it to room temperature to fluff it up. Add salt, cream, vanilla and mix until a fluffy buttercream frosting about 2 minutes. Add more cream if needed. Using a piping bag or piping decorator fill with the coloured icing of choice and tip. Pipe a layer around each of the cooled cupcakes changing to the next colour until all colours are finished or use one colour and pipe around the cupcake starting from the outside and moving inwards and upwards. Do not freeze and eat with-in 2 days. If you do choose to make the buttercream frosting in advance bring to room temperature and then whip it up in the mixer until fluffy. This will bring the delicious buttercream frosting back to life. I love how creative and colorful these cupcakes are! They look like so much fun to make, too. They were and honestly they are so simple to make. I think many people might shy away but it’s nothing more than food colouring.